The use of computer-aided design (CAD) software is particularly ill-suited during conceptual design where product development tends to be very open-ended and large changes to the geometry definition are typically required in order to explore a vast design space. Organizations which use CAD throughout all phases of product development tend to recoup some of the time and resources expended when using traditional CAD packages during conceptual design by their ability to carry the design forward through subsequent design phases. However, this benefit isn’t necessarily realized for those organizations, or users whose activities don’t span the entire design cycle. The OpenVSP team at NASA Langley has identified those deficiencies inherent in adapting traditional CAD software packages for use during conceptual design, and they have created a nicely packaged software tool for parametric geometry modeling which accommodates many of CAD’s shortcomings. The software named Vehicle Sketchpad, otherwise known as OpenVSP, is a freely available download from their website. OpenVSP generic transport model used for anisotropic unstructured mesh automation using Glyph in Pointwise. Earlier last month, NASA Langley hosted their third OpenVSP Workshop 2015 at the National Institute of Aerospace (NIA) in Hampton, VA. The workshop provided a venue for OpenVSP developers, new, and experienced OpenVSP users alike to share and learn more about the software. During the workshop a number of sessions provided information ranging from introductory and advanced model building, recent additions to the software, as well as several use cases highlighting how the diverse OpenVSP community has adapted and used OpenVSP for their own purposes. Through the first day of the workshop, sessions provided a comprehensive introduction to OpenVSP directly from its developers. The initial morning sessions were used to present the design goals and motivation for continued development of OpenVSP, and these were followed up with introductions of the various 3D parametric modeling operations available within the software. During the afternoon sessions on the first day, attendees collaborated with presenter Bill Fredericks for a hands-on demonstration wherein OpenVSP was used to create a Predator B model based on a suggestion from one of General Atomics Aeronautical Systems’ employees in attendance. Publicly available information regarding the aircraft’s design was gathered by those in the audience while Fredericks’ carefully re-created the aircraft within OpenVSP. In about 45 minutes, the group had put together a fairly representative Predator B aircraft model using the software. The second and third days of the workshop were reserved for an overview of the physics-based analysis capabilities packaged within OpenVSP. These include built-in mass properties and aero reference tools, a vortex lattice solver (VSPAero), and an interactive wave drag prediction tool. Sessions also included a number of presentations from users demonstrating how they have incorporated OpenVSP into their own work. 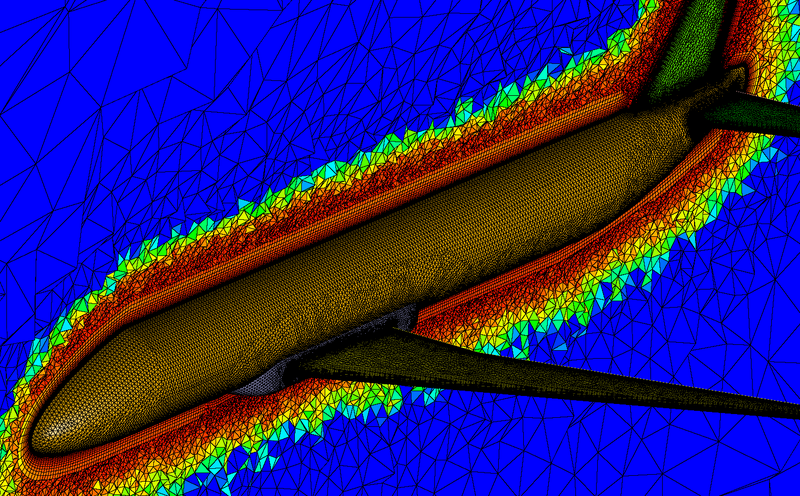 Highlights included presentations covering rapid aircraft structural modeling, high-lift prediction, and meshing for CFD. Presentations from this year’s OpenVSP workshop can be found at OpenVSP’s Workshop page. This year OpenVSP developers further improved OpenVSP’s STEP file export feature making it more robust, and they also included support for easily creating blunt trailing edges which typically help improve mesh quality near these localized regions. Pointwise leveraged these recent enhancements to OpenVSP to demonstrate Pointwise’s automated meshing capabilities. The generation of an anisotropic viscous surface and volume mesh for a complete generic transport aircraft configuration exported from OpenVSP was fully automated in Pointwise using Glyph. The Glyph script was written to mesh the configuration using recommended practices while exposing only a limited number of meshing parameters. Fully meshed generic transport configurations resulting from Glyph automation in Pointwise. If you would like to learn more about the Glyph script we put together and the workshop, it is available for download from Pointwise’s Glyph Script Exchange hosted on GitHub. Also keep an eye out for the next issue of The Connector where more details about the script will be provided. Pointwise also has an upcoming Glyph Scripting course scheduled for 15 through 17 of September hosted at Pointwise’s office in Fort Worth, TX. Registration is free to current customers and spots are still available for next week’s class if any are interested in learning more about Glyph. This entry was posted in Events and tagged aircraft design, automation, CAD, Glyph, meshing, OpenVSP, T-Rex, training, workshop. Bookmark the permalink.